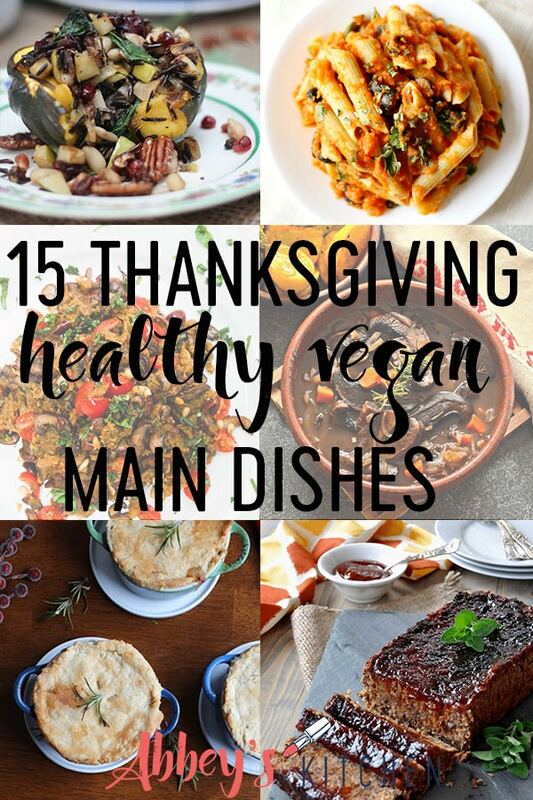 Below are 15 vegan thanksgiving main dishes that will be a great addition to your Thanksgiving dinner (note these don’t require a turkey, chicken, or duck, … or a combination of all three in one). With pumpkin spice everything available and October fast approaching, as Canadians we are gearing up for Thanksgiving on Monday October 9th. Thanksgiving is the perfect opportunity to reflect and be around family, friends, and food! Here at Abbey’s Kitchen we wanted to celebrate Thanksgiving by compiling 15 of the best vegan thanksgiving main dishes to serve this holiday season. Even if you’re not vegan, introducing a variety of plant-based food options that can accommodate many of your loved one’s diet and lifestyle choices can also be the perfect and healthy addition to a delicious plate. I know I am giving thanks to fresh fall produce and products that are available in Canada, and thanks to the amazing food bloggers listed below who shared their vegan thanksgiving main dishes with us to help us create more memories at the dinner table! Turkeys aren’t the only Thanksgiving dish that can be stuffed with deliciousness. 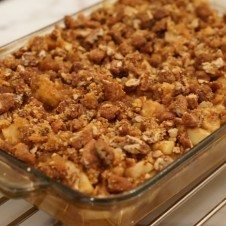 The sweetness of the butternut squash, the tartness of the cranberries, and the nutty flavour from the walnuts compliment each other really well for a showstopper at the table! I always love dishes that basically involve an edible plate. Perfect for individual portions, these beautiful squash are the ideal vessel for the delicious and healthy combination of lentils, onions, and tomatoes. This is definitely a seasonal and creative spin on the classic tomato sauce, ricotta filling, and parmesan. I love how healthy additions can be made such as the whole grain pasta, cashew and walnut ricotta, loaded with veggies, and topped with pumpkin seeds. While the classic handful of nuts are a great snack too, this recipe shows its versatility to transform nuts into cheese. 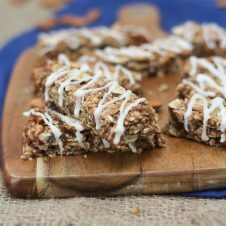 This is definitely not your traditional loaf, but a healthy recipe packed with protein from the lentils and fibre from the brown rice and oats. Healthy food never has to be bland but can serve as a great base to balance the wonderful and bold flavours of onion, garlic, thyme, and sage. Tasty and healthy recipes don’t have to be complicated, and that’s why this recipe is perfect for the busy holiday season. Put that pumpkin centerpiece to good use and try this recipe! One dish meals are perfect for family-style dining, which lends nicely to serving it at Thanksgiving for the whole family. The beauty of this dish is not only do the flavours have time to mix and mingle, but it contains high-fibre sources like sweet potatoes with the skin on, kale, beans, and buckwheat! It’s mushroom heaven for this recipe that provides wonderful textures in each bite from the soft mushrooms and chestnuts with the flaky pastry. Spaghetti squash is a blank palette that can be transformed into something beautiful like this recipe. I love how the rich and salty flavours of pesto, pine nuts, and kalamata olives can be balanced by the nutritious delights of mushrooms, tomatoes, and squash. I love how creamy pastas don’t necessarily mean alfredo, but can involve pumpkin as well! 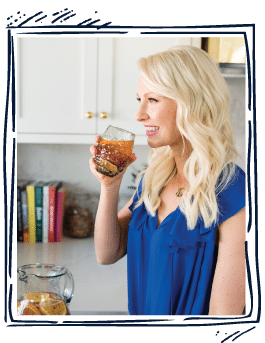 Many of the ingredients can be purchased ahead of time or may be in your pantry already which helps during the weekend rush before Thanksgiving! Mushrooms are a vegetable that take on the bold flavours of garlic, thyme, rosemary, and basil – and this recipe is no exception. This recipe screams comfort food and will be enjoyed at the dinner table. 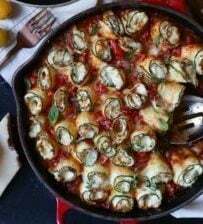 I believe this recipe combines familiar food preferences like puff pastry with lentils that is a nutritious, vegan-friendly ingredient your family members and friends will enjoy once they try it. The use of the muffin pan for individual servings allows for a perfect and portioned bite. This can be a staple holiday recipe that takes a classic dish, with a nutritious spin with kidney beans as the protein source! Meatloaf can sometimes get a bad reputation, but there will most likely be no leftovers once this is served on Thanksgiving. The beauty of this is the filling may not be meat, but we’re still getting the protein we need from plant-based alternatives. As the leaves begin to change colours, this is the perfect option for a hot from the oven, delicious meal. The varying textures such as the flaky crust, soft vegetables, and creamy sauce compliment each other. I love oven roasted meals because we can retain the flavour and moisture and veggies can be integrated as part of the main dish. Hands down this vegan stuffed acorn squash recipe not only tastes like fall but also will be the quickest thanksgiving main you’ll ever make. There you have it. It’s clear that you don’t need turkey to be the star of your thanksgiving meal. 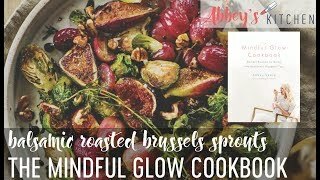 I hope these recipes have given you some inspiration for your feast and Abbey’s Kitchen would like to wish you and your family and friends an amazing and most importantly a TASTY thanksgiving. Have you tried any of these vegan thanksgiving mains yet? Are you serving up any vegan mains this thanksgiving? These all sound so amazing! 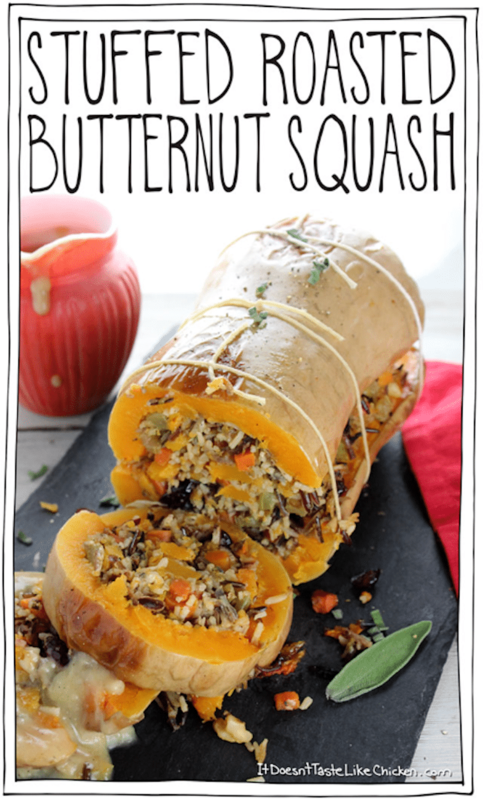 I am definitely going to try the squash rollups!!! 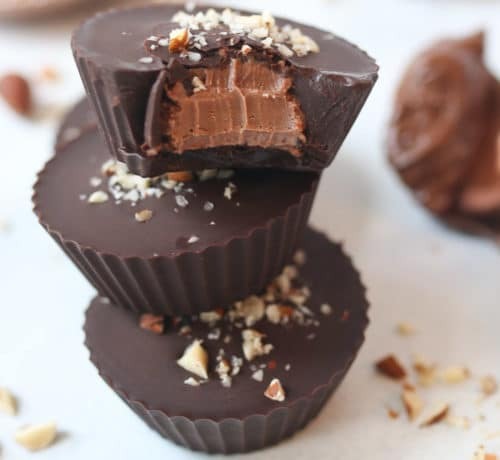 These are some tasty ideas. I’m not sure I’ll be able to wait until November to try them! haha you’ll have to celebrate Canadian Thanksgiving then! that wellington is calling my name. This delicious line-up is really getting me in the mood for fall food. Thanks for including my pot pies! These are beautiful recipes! Mind blown with the butternut squash — looks just like a roast! Love it. These are great vegetarian options for the holidays! Love! 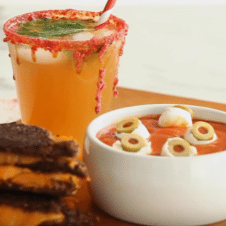 These recipes look AMAZING! I’m especially interested in the meatloaf one! Thanks so much for including my [email protected]! sharing! Love all the thanksgiving foods! I actually go to a vegan thanksgiving every year, so these would be perfect to bring! I had Turducken once. Grossest/weirdest concoction I’ve ever had. Never again. That portobello dish sounds delightful! wow you are way ahead of the game! I have not even thought about Thanksgiving yet and we are hosting it! Yes! It’s so soon girl! Good luck to ya! My mouth started watering as I scrolled through this healthy and delicious collection of fall food. Thank you for including our Smoky Southern-Style Meatless Meatloaf. Sharing!